Gold is shining bright. Year on year it is touching to new benchmark price. This year gold has given around 16 % returns on investment. With current global economic conditions gold is expected to rise further. It is well known fact that whenever a economy encounters big calamity, all investors rush towards gold as a stable investment option. 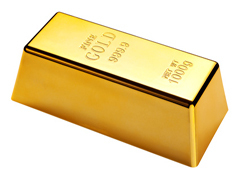 There are several factors that still support the higher prices of gold at current levels. Indians associates & hedge funds are buying gold like anything. Diwali and Festival season is nearby and demand in gold is about to increase. This increase in demand during the festive reason will push up the price of gold. Most of expert believes in this and they ask investors to hold on to their gold investments for some more time. You should hold gold and do not book profit now because of the ongoing domestic and global uncertainties gold price may rise. India is the largest consumer of gold with an annual demand of about 700 tonnes. Experts say that unlike gold coins and bars, for which most jewellers offer only an exchange, gold ETFs are sold at transparent prices across the country. No sales tax, VAT, wealth tax or securities transaction tax is additional advantage of investing in Gold ETF. As price of gold has reached to peak mostly all investor are in confusion mode weather to invest or not. Although gold has peaked you can invest in gold through the Gold ETF SIP route. SIP route will take care of averaging cost. There are as many as 25 different gold ETF schemes across 14 different fund houses at present. These products, which track the metal’s prices, provide an opportunity to investors to accumulate gold over a given period of time since they can be purchased in small quantities. As you can invest in small quantity you should avoid investing lump sum amount in gold today as you cannot time the market. In case of investing in gold as gold ETF you need demat account if you don’t have demat account you can consider buying gold fund which invest in gold ETFs or you can purchase physical gold by buying gold bars or coins, but you will be spending additional cost like VAT, wealth tax. You have to make arrangement to store this gold in secure place. Apart from this you have to conduct due diligence on the purity of the gold before buying. Form of investment also depends upon purpose. If parents are investing for the purpose of children’s marriage than its better to purchase gold jwellery directly but if you are planning gold as pure investment for getting good return than it is better to invest in Gold ETF. Investment in gold is very good from return point of view but gold will not earn you any interest like FD. It does not even offer a dividend like equity instruments. Some investors are mad behind gold and they invest in gold like anything my advice is you should stick to your asset allocation strategy & you should not place your all money in single asset class.